Dose reduction remains in the spotlight, but scanner manufacturers see other needs driving CT purchase decisions. Talk to physicians about CT scanners, and the conversation usually will turn toward radiation dose, but that’s not the only topic on the mind of specialists who work with CT on a daily basis. 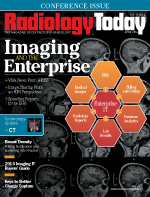 Spectral imaging, the ability to obtain more information from images, advanced iterative reconstruction techniques, and technologies to improve workflow also are important to evolving CT technology. Jakub Mochon, Siemens Healthcare’s director of marketing and operations for CT, says dose reduction talk still is everywhere, but just as important is creating a better imaging experience for both patients and users. When it comes to the latest advancements and technology upgrades, the core theme from original equipment manufacturers (OEMs) seems to stem from the challenge of making CT systems that are fast, easy to use, and accurate. Looking around the industry, recently released or announced CT scanners are designed to address new clinical pathways to personalized medicine and improve speed, ease of use, and accuracy. Today’s CT scanners provide clinicians with more information in the hope of helping physicians make earlier, more definitive diagnoses and improve patient care. Andy Mack, Philips Healthcare’s senior director of product management for CT, says innovation has been reinvigorated regarding Philips CT offerings, and he sees this same trend throughout the industry. The company also touts iPatient, a platform designed to facilitate patient-centered workflow and the production of high-quality images at low dose levels. According to Mack, this platform will increase users’ ability to efficiently perform complex and advanced procedures and to handle future innovation, such as Philips’ IQon Spectral CT.
Steve Gray, president and CEO of molecular imaging CT and Advantage Workstation for GE Healthcare, sees a race involving strategy among the OEMs, with each company going in a different direction with technology trends and not just worrying about who’s fastest and who’s first. He believes GE’s focus on providing the best possible images with lowest possible doses with its Revolution CT has become the talk of the industry, as the technology enables clinicians to noninvasively visualize the human heart more clearly than ever before and diagnose more patients with erratic or high heart rates. The system, which is awaiting 510(k) approval, can capture a motion-free image of the human heart in just one beat. According to Gray, another step in low-dose technology is the introduction of the latest adaptive statistical iterative reconstruction (ASiR) technique, ASiR-V, which is part of Revolution CT. The technique combines the speed of ASiR with more of the capabilities of GE’s Veo full model–based iterative reconstruction. ASiR has been installed on more than 3,600 CT systems worldwide and has been involved in more than 31 million scans to date. GE’s Discovery GSI, announced during RSNA 2013, is designed to reduce CT dose and deliver seamless workflow. Its purpose is to provide clinicians with patient care improvements such as virtual unenhanced imaging, and the first high heart rate coronary and stress perfusion protocol with integrated GSI Cardiac and SnapShot Freeze. Since Toshiba introduced its first Aquilion ONE in 2007, it’s been making modifications that have reduced radiation exposure up to 90%. Its Aquilion ONE ViSION utilizes an alternating focal spot that allows 16-cm z-axis coverage to be sampled twice, thus generating 640 slices in one rotation. Its innovative adaptive iterative dose reduction technology can acquire anatomical and functional data simultaneously to change and improve clinical pathways. Samsung’s NeuroLogica series transforms fixed CT technologies into portable platforms, allowing physicians to utilize mobile devices, which Ryan says helps with safety and changes the whole point-of-care paradigm. Last year, Samsung introduced its NeuroLogica BodyTom, the first portable, 32-slice full-body CT scanner. With an 85-cm gantry and 60-cm field of view, BodyTom enables surgeons to capture high-resolution 3D images intraoperatively and immediately verify surgical results before the patient leaves the operating room. Improving patient experience also was behind the company’s 128-slice SOMATOM Perspective CT system, which, according to Mochon, was designed with the community hospital in mind and includes an illumination mood-light feature. Meanwhile, the company’s Force CT machine eliminates the need for patients to hold their breath to obtain chest or abdominal images. “Our goal at Philips is to deliver meaningful innovations that matter to our clinicians and their patients,” Mack says. “We continue to launch and provide solutions that help clinicians provide a confident diagnosis, deliver the best care to their patients, and help them do more with less. Ryan believes that health care now requires more cost-effective solutions thanks to government reimbursement cutbacks, resulting in hospitals using a mixture of high-end CT scanners and general systems for body imaging and contrast study. As a result of accountable care and reimbursement reductions, Mack says hospitals are looking for ways to do more with less. “We recognize their challenges and are diligently innovating solutions that can help them to get to their diagnosis faster while at the same time providing the best care at the lowest cost,” he says. CT is the backbone of diagnosis in health care organizations because it delivers high image quality, low dose, and speed to help clinicians manage challenging and diverse clinical scenarios. Looking into a hypothetical crystal ball, Ryan believes the future of CT will be scanners that are faster, more automated, and easier to use, with the goal of transitioning from a good interpretation tool to something with more quantification and a speedy and direct diagnosis.